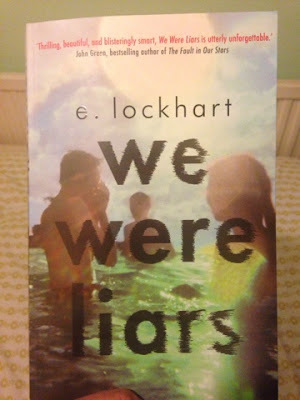 So I have just finished reading 'we were liars'. As per usual I read a few reviews first because I was trying to choose between a few on my TBR list and I wanted to see what was big in the blogging world. I am kind of annoyed that I did because although the reviews didn't give away any explicit details, they left me expecting things from the book and they left me guessing. So I have decided that with this particular book there is really nothing that I can say. I want to tell you so much about it but I don't want to ruin it or spoil it for those of you who haven't read it already. My advice is that you should just go and read it- it's short, I read it in an afternoon. I'm sure you will love it, it will intrigue you and it may even make you cry. But if you came here for a glimpse into the characters and the story line I am afraid you have come to the wrong place, this is a story that I believe you have I go in blind to really appreciate it. I would just like to make some general comments, there were a few metaphors which I just found were a bit too dramatic and unnecessary and on occasion I found it to be a bit pretentious- this is not necessarily a criticism but it just wasn't to my liking. The quote on the front is from John Green and in a weird way I see a lot of him in the book- the metaphors, the pretentious teens etc. although the metaphors aren't quite as succinct and memorable as his. It's the sort of book that you immerse yourself in, digging yourself into their little world and then when it's over you don't really know what to do, where to go or what to read next. I am sorry that this short review hasn't been very informative but I think it's the sort of book that works best if you don't know anything about it beforehand.